International Journal of Research in Health Sciences,2018,6,2,9-15. Department of Microbiology, KD Medical College, Hospital & Research Center, NH#2, 24Km. milestone, Akbarpur (Uttarpradesh), Distt. Mathura, INDIA. Objectives: This retrospective study was conducted to determine the prevailing antimicrobial resistance pattern amongst blood culture isolates from culture proven Enteric fever cases in a rural tertiary care teaching hospital. Methods: This retrospective study was conducted in a rural tertiary care teaching hospital wherein the Laboratory data of blood culture positive cases of Enteric fever maintained over a period of 2 years from July 2015 to June 2017 was retriewed, reviewed and analysed to determine the antibiotic susceptibility pattern of S.enterica isolates. Results: 512 blood samples processed for culture sensitivity yielded 30 strains of Salmonella typhi (86%) and 5 strains (14%) of Salmonella paratyphi A. S.typhi strains showed highest susceptibility towards Imipenem (100%) followed by 3rd generation cephalosporins (>90%), Aztreonam (90%), Cefepime (90%), Levofloxacin (86.67%) and Ciprofloxacin (70%). 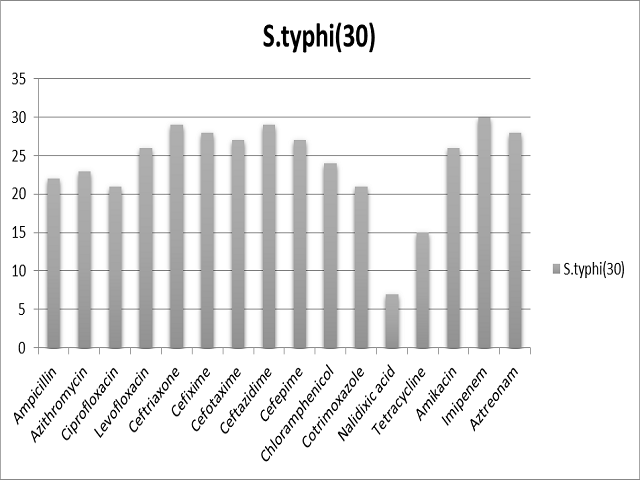 S.paratyphi A strains showed highest susceptibility towards Cefixime, Ceftazidime, Ceftriaxone, Amikacin & Imipenem. Conclusion: This study emphasises the need for doing blood culture and antibiotic susceptibility testing for each and every suspected case of enteric fever. Irrational inappropriate indiscriminate usage of antibiotics must be strictly curbed through antimicrobial stewardship to prevent the emergence of multidrug resistant strains.